Here is an example of the sort of request that we get as part of our everyday tree sales business. Is it too late in the year to order fruit trees from you? I am looking to plant 12 trees in a space I have been opening out, but I am unsure of whether the trees will survive in the existing soil there. The soil on most of the site is a light coloured dense clay, and although your website states that the M106 rootstock can normally survive, I wonder how well I might expect the trees to cope with it? The site is on an east-facing slope which gets lots of sunlight until late afternoon – though I may remove some of the trees which start to shade it then. If it is indeed too late in the year to be considering planting these trees, we would still be looking at putting them in next year. To answer your questions calls for a look at the physiology of the fruit tree. Putting it another way; it is a help to have an understanding of “the way the tree ticks”. 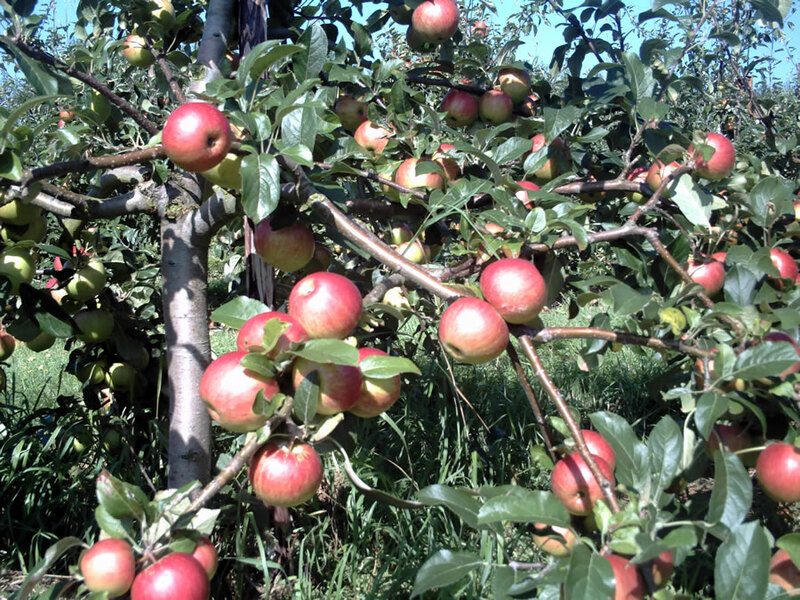 Fruit trees can be grown successfully in any soil. As long as it is possible for the roots to take up water and the basic nutritional elements such as N, P and K, plus the trace elements, then the fruit tree can establish itself. Therefore a permanent SOIL MULCH in your particular case is of great importance. This needs to consist of old disintegrating materials such as old wet hay or straw. Or better still, farm yard manure. This will have to be topped up on an annual basis and to have a minimum thickness of 4 to 5 inches. To be applied around the trunk of each tree covering a soil area of a minimum of 1.5 square yards. It is of great importance that the mulch remains largely weed free and therefore is of 100% benefit to the tree and not the weeds.Leave a small ring around the trunk free from mulch as the trunk must remain dry and not permanently damp. This to stop fungi infections of the trunk. months, roots have to grow significantly. This can only happen when sufficient oxygen is available in the rooting area. Therefore in your case, improve the drainage if it is suspect. Lastly you will have to stake each tree. This because in your case surface rooting of the trees is very important due to the nature of the soil. Now if you take these basic principles in consideration you can grow fruit trees successfully. What I would do in your situation is to plant now 2 apples, 2 plums, 2 pears. Definitely no cherries as these require more soil depth than any other fruit tree. This coming growing season you will then have the opportunity to observe the behaviour of these trees. Then on the knowledge gained, you can the plan next year’s plantings. Provided you let me know within the next few days how many trees you will need, we will be able to supply the trees within a matter of days before the trees break into growth. I hope this answers some of your questions. If you let me have your phone number and your full address we can always discuss further details by phone.